Prepare for the hike. Dress for the season but be prepared with protection from the sun year-round. Sturdy hiking boots are recommended but not necessary on this hike unless you intend to explore some of the more rugged terrain. On a normal winter day a liter of water should be sufficient but bring three or four times as much in the summer. 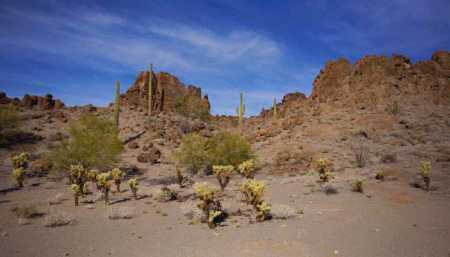 Access to the area requires a permit for the Federal Lands which is free and can be obtained at the Cabeza Prieta Wildlife Refuge Headquarters in Ajo, AZ. Its address is 1611 North Second St. Ajo, AZ 85321. The phone number is (520) 387 6483 Allow a half hour to watch a safety video and complete a form to receive the permit. Leaving the Cabeza Headquarters turn north on Route 85 towards Gila Bend and drive for approximately 10 miles until you get to gate 15 on the east (right) side of the road. You will have the combination with your permit. Let yourself in and close the gate behind you. Please do not abuse the privilege of exploring the desert on Federal lands and practice “leave no trace” hiking. The walk can begin here as the terrain at gate 15 is part of Crater Range but this particular hike will begin about a mile from the gate. The road is fairly good for almost any vehicle. 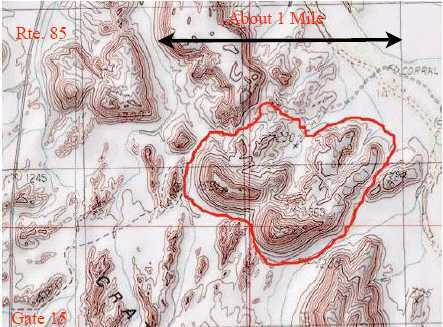 There is a small area to park designated by a stone fire ring near 32º 33.16’ N, 112º 52.10’ W.
The elevation change is almost zero as you can walk on flat terrain between the rock spires and volcanic upheavals. Additional difficulty is added at your discretion or expertise, by exploring higher up. Proceed due east into the first valley with one note of caution. After you have walked through several valleys, or calderas, essentially little box canyons surrounded by volcanic formations, it can become very disorienting as they are similar in appearance. It is highly recommend that a global positioning device (GPS) be used to retrace the route when needed. The map shows a total walk of over 2.5 miles but much shorter routes are rewarding. Range Formation. Crater Range is comprised of several miles of volcanic upheavals on both sides of Highway 85 about 10 miles north of Ajo, AZ. Not all of it is accessible for exploration due to its inclusion in the active part of the Barry M. Goldwater Proving Grounds. The geology you will experience is generally irregular lava flows, layers of tuff and volcanic breccia. It is not a “crater” at all but is the erosional remains of volcanic features. The ridges are the remains of dikes which are more resistant to weathering than the tuff surrounding them. Numerous sharp spires were volcanic conduits for molten magma and, like the dikes, weather more slowly. The lighter colored hills show evidence of precambrian granite and gneiss. That said, it is the fascinating arrangement that will hold your attention as you walk from one canyon to the next. The colors of the geology change often from the expected black volcanic rock to reds and browns and beige. Based on the time of day you enter the area one could see many types of wildlife ranging from Big Horn Sheep and Mule Deer to lizards and many of the birds found in the Sonoron Desert. A seasonal tinaja in the range holds water for long periods following rains and brings in many of these animals. The terrain displays the many forms of plants and cacti found in the Sonoron Desert. There is a slight indication of a trail that bends to the northeast through several canyons. A sharp eye will be able to detect evidence of ancient cultures. One piece of this evidence is the mortars carved into the horizontal bedrock for grinding seeds of the local trees. 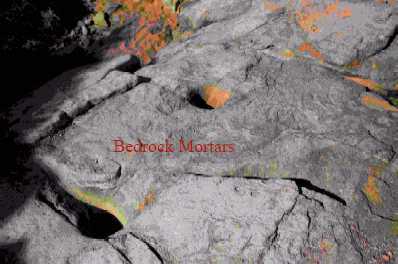 Another is on the vertical rock surfaces in the form of both ancient and modern petroglyphs. This hike will take about 2 hours but the beauty of the terrain and the expanse of area could easily use up several days of repeated exploration.